A 2008 snapshot of the five convicted killers. 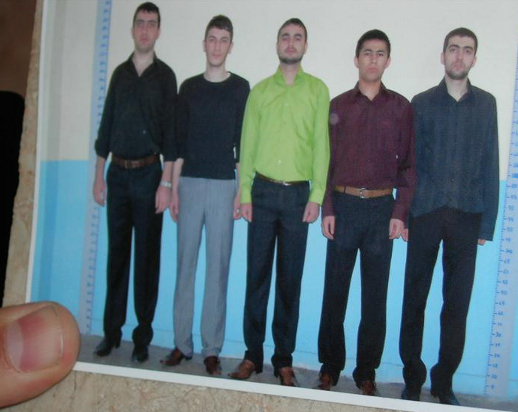 UPDATE (3 Oct.): Five Turkish men convicted last week of the 2007 murder of three Christians in southeast Turkey – but allowed to remain free – have been re-arrested. They were picked up on Thursday evening (29 Sep.) after the prosecutor, Burhanettin Olgun, expressed fears they may flee Turkey. Turkey’s tiny Protestant community said their confidence in justice had been “severely wounded” by the decision to let the killers remain free. The five will now remain in custody until their appeals process is concluded. News of the long-awaited verdicts in the notorious “Malatya massacre” case quickly flashed throughout the Turkish media at the conclusion of the trial’s 115th hearing. Emre Gunaydin, Salih Gurler, Abuzer Yildirim, Cuma Ozdemir and Hamit Ceker were all found guilty of premeditated murder, to be jailed for life without the possibility of parole. But most media outlets failed to report the court’s surprise ruling: that the now convicted killers would in fact still remain free, subject only to routine surveillance, while the case is being appealed before two higher courts. The three Christians killed (left to right): Necati Aydin, Ugur Yuksel, Tilmann Geske. During the next seven years of trial proceedings, begun in November 2007, the defendants and their lawyers insisted the attack was an attempt to stop the “harmful activities” of missionaries who were allegedly trying to destroy the nation of Turkey and the honour of Islam. A major scandal soon broke out when the Interior Ministry was forced to open an investigation over alleged collusion of public officials and seriously flawed conduct by state prosecutors in the case. Then in March 2014, the suspects’ release on bail under a newly-passed reform law shocked Turkey’s tiny Protestant community, despite assurances that the men would be held under house arrest. (Under Turkey’s now current Code of Criminal Procedure, a suspect cannot be detained for more than five years before the final verdict is reached.) The three who lived in Malatya were then fitted with electronic tracking devices, while the other two living in outlying towns were required to report weekly to their local police station. So now, even though Malatya’s first instance court has found them guilty, this ruling must be reviewed and approved by the Court of Appeals before the sentence can be enforced. Deploring the judiciary’s stated inability to “uncover the darkness behind the murders”, Ozbek declared that the Protestant community desired a prompt, “just conclusion” that uncovered the motivation of the perpetrators and punished their crime.